North Thousand Islands Water Resources (SDA) Unit cleans connecting (PHB) channel located at RT 05 RW 01, Kelapa Island Urban Village, North Thousand Islands.
" We got report from locals regarding this channel. They want channel's water to flow smoothly"
Thousand Islands SDA Sub-department Head, Saiful explained, that PHB channel is silting due to mud sedimentation and garbage. Thus, personnel are deployed to clean it. "We got report from locals regarding this channel. They want channel's water to flow smoothly," he said, Wednesday (1/9). 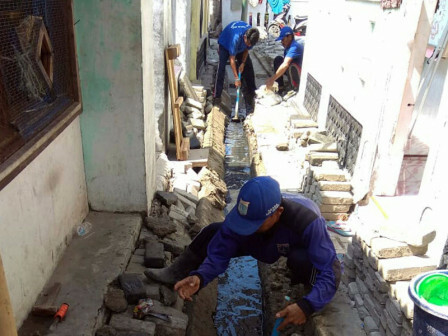 His side deploys 20 SDA Unit personnel to clean this 270 meters channel. This afternoon, personnel has collected 50 sacks full of garbage and mud from the channel. "This cleaning is targeted to finish tomorrow. Hopefully with this, water can flow smoothly, especially in this rainy season," he conveyed.